Detroit, are you ready to speak your truth? This city is a place where several layers of truth coexist—sometimes peacefully, sometimes in harsh opposition. Many aspects of Detroit are painted as black-and-white issues, when it is, in reality, a place that contains various shades of gray and a lot of personal stories. Seeking truth is ostensibly the guiding principle of In Search of the Truth (The Truth Booth), a mobile recording studio by a team of artists known as Cause Collective that has been touring the world since 2011, offering participants of all stripes the opportunity to record their personal truths. 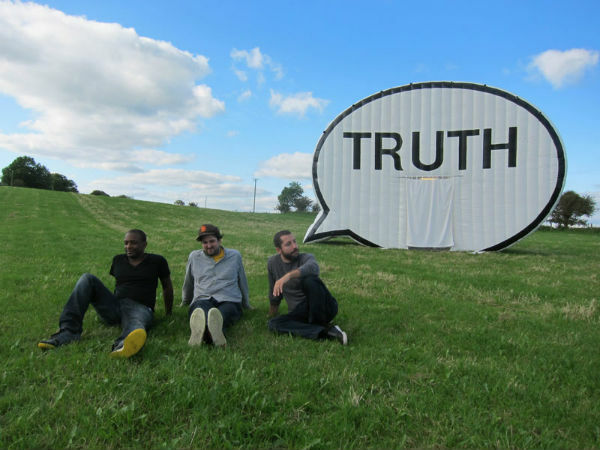 Due to the efforts of Cranbrook Art Museum and their Curator of Contemporary Art and Design, Laura Mott—not to mention a large piece of funding from the John S. and James L. Knight Foundation—The Truth Booth is slated to make an lengthy tour of the region with their Michigan debut scheduled for July 31st at the Cranbrook Art Museum. They hope to reach all 50 states by November 8th—Election Day—but their Michigan stop is the longest and most extensive of their U.S. tour. Image courtesy of Cause Collective – thank you!